Rural markets – Guizhou C.I.T.S. Living scattered and being busy with their farm work, farmers have no time shopping in the town often. Then through negotiations, the neighboring villagers fixed some certain dates for trading goods that included some crops produced by themselves, it was so-called Villages Fair or Rural Market. In order to keep this market being continued to proceed successfully, different areas followed different rules of timetable according to their own customs. Some took solar calendar, some took lunar calendar and some took weeks. When the date of the market comes, the farmers bring their productions to sell and buy home some necessities. The businessmen come to do their business, and some citizens from the cities also come hunting some fresh and cheaper things. 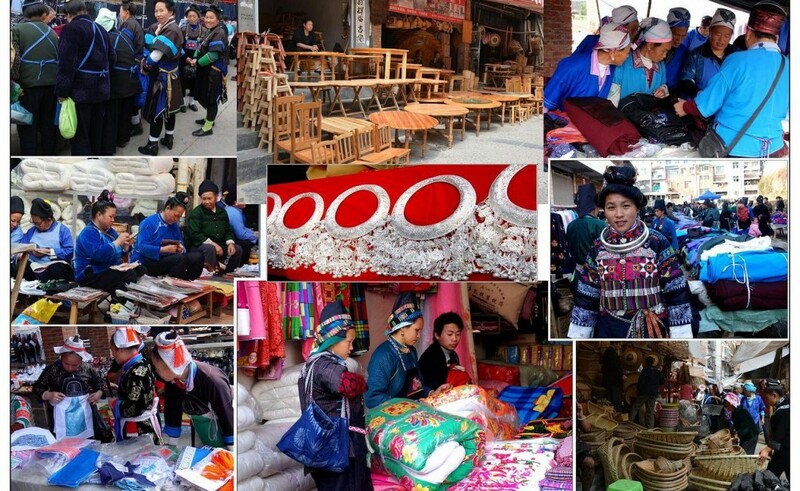 With the time goes on, the traditional rural market has been getting richer and more colorful; the seldom-meeting old friends take this day as the opportunity to gather together chatting and many new friends can also be made. The young people wearing beautifully come in groups to look for someone of their hearts. So they all try to show each other the deepest impression. And now a day it is also a very good opportunity for some organizations from the government to disseminate to the public new policies or so and for some big companies, China mobile for example, to promote with leaflets and pasting advertisements during this date. Now the rural market is the real big local fair! !